A few of the approximately 19,000 solar panels installed at the University of Illinois Solar Farm. IPR's Jim Meadows reports on a new addition to the ways that the U of I generates its electricity. 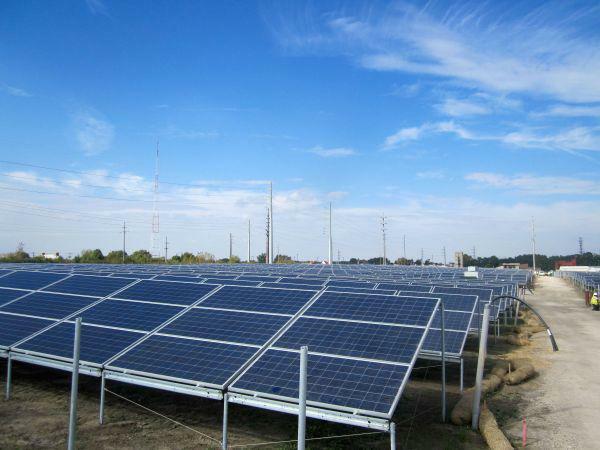 The first solar farm in east central Illinois is now supplying a portion of the electricity used by the University of Illinois Urbana campus. The “farm” consists of thousands of solar panels, installed on what had previously been nearly 21 acres of crop land in the university’s South Farms, on Windsor Avenue near the Canadian National tracks. They’re a new addition to the ways that the U of I generates its electricity. Work on the solar farm began in July. By September, workers were mounting close to 19,000 crystalline solar panels onto poles, some short and some tall. Norm Spooner of Phoenix Solar was the solar farm’s project manager. Phoenix Solar built the solar farm, and will run it for the first ten years, selling its electricity to the university. “There’s a pre-assembled rack (also called a cartridge) with three solar panels on it,” said Spooner, describing the installation of the panels. “We set that cartridge on a set of four poles. The long one is on the north side, the short one’s on the south side. And that gives you your 20-degree angle that we need for facing the sun." On November 12th, the U of I Solar Farm began delivering electricity to the Abbott Power Plant, for distribution to the Urbana campus. The solar farm is expected to supply 5.87 megawatts of electricity annually --- which means about 2% of the electricity used by the Urbana campus will be coming come from the sun. The site of the University of Illinois Solar Farm, on Windsor Avenue near First Street and the Canadian National Railroad Tracks. 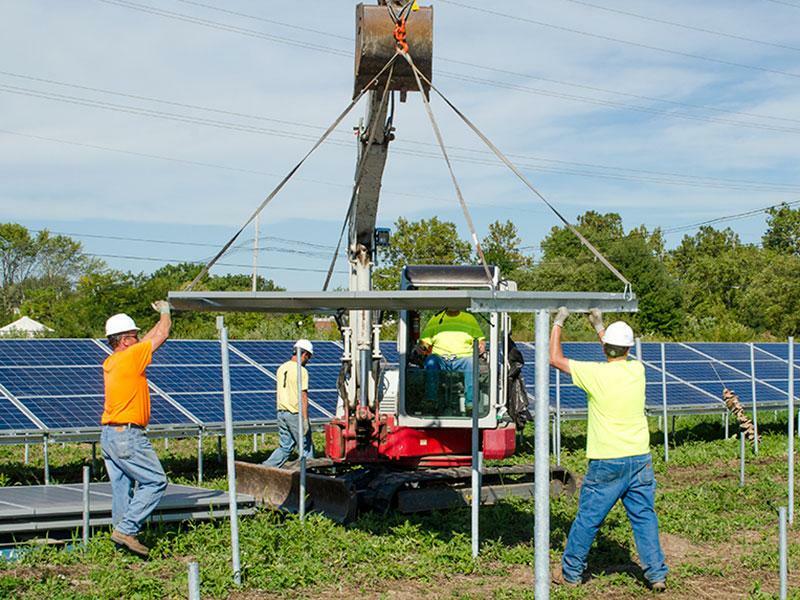 Workers install a cartridge containing three photovoltaic panels at U of I's Solar Farm in August. Solar PV’s are photo-voltaic cells used in solar panels. And recent improvements have lowered the average cost of solar electricity by nearly 25% in the past year alone, according to the Solar Energy Industry Association. That improvement is something that David Loomis has noticed. He’s director of the Center for Renewable Energy at Illinois State University in Normal. Loomis says they’re watching the U of I solar farm project with an eye towards building a similar installation at ISU someday. Loomis thinks solar could one day play a bigger role in the nation’s energy portfolio. “Now we’re less than, one percent of our electricity’s coming from Solar,” said Loomis. 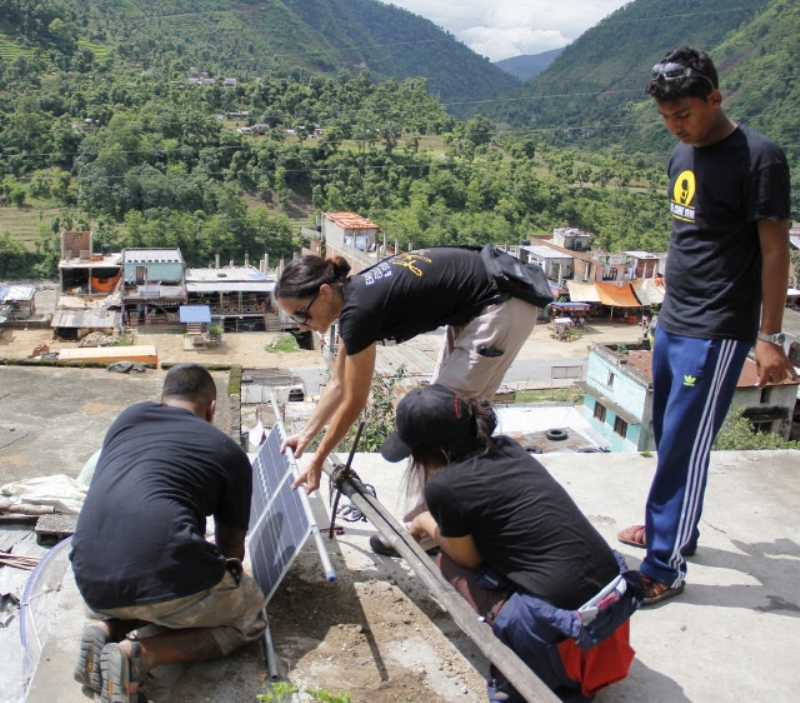 “So if we think about having diversity in our electric generation mix, it would seem that solar has a much bigger role to play. And we could see huge growth rate, without it really being very high.” Loomis points to California, home of solar farm operator, Phoenix Solar. California gets 5% of its electricity from solar energy, enough that the challenge there is how to quickly ramp up generation from other power plants at night, when solar panels are not generating power. Nighttime is the big challenge facing solar power, and Loomis says while storage batteries have improved, they’re not good enough to make solar panels a 24-hour energy source yet. 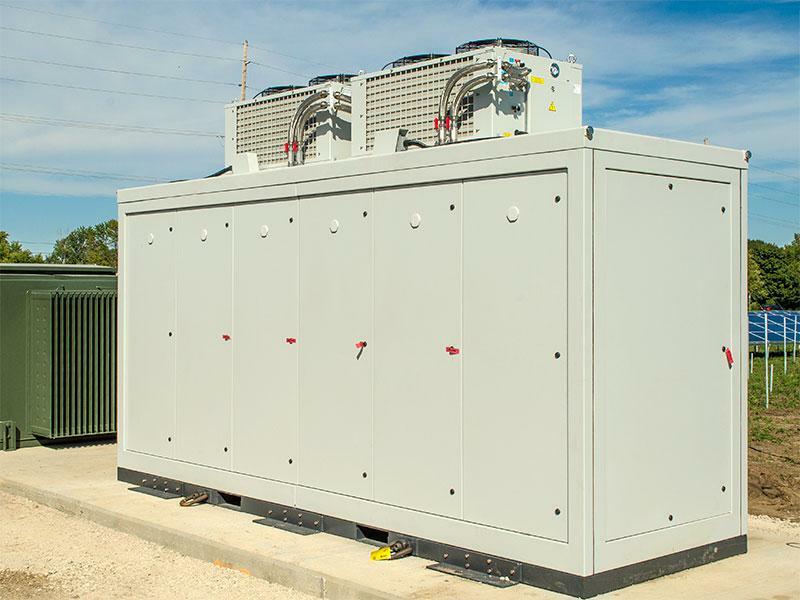 An inverter converts electricity from DC to AC before sending it to the Abbott Power Plant. But the U of I’s Morgan Johnston says the campus Solar Farm will provide extra electricity at the right time of day for them. “With solar, it’s creating the electricity at the same time that we’re needing it,” said Johnston. “It’s higher in the summer when it’s warmer and we have more air conditioning going. It’s off at night, when the lights are off. 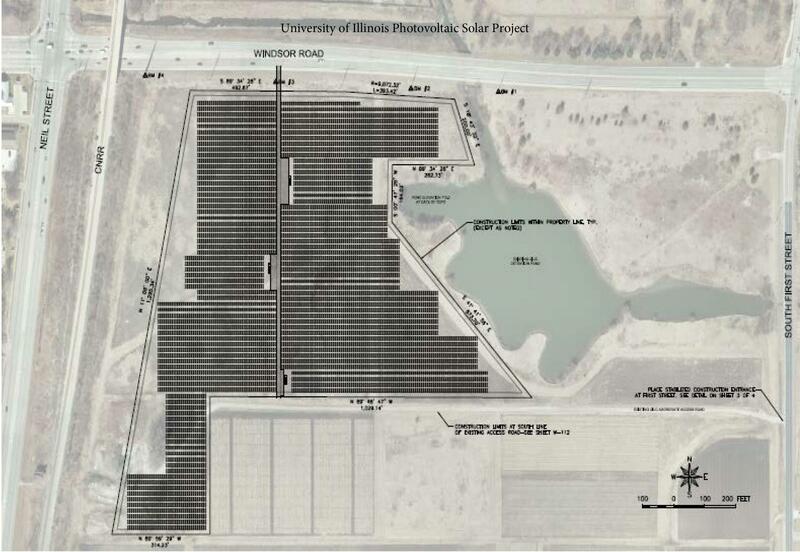 So it’s unlikely that storage is going to impact how we use solar.” After ten years, ownership of the new U of I Solar Farm reverts from Phoenix Solar to the university. In 20 years, the upfront costs of the Solar Farm will have been paid off, and solar electricity from the facility will finally be a bargain. The warranty on the solar panels will expire at about that time, but they’re expected to be functional for another 20 years after that. And by then, Johnston expects even better solar technology will be available --- good enough, perhaps, to help the University of Illinois achieve its long-term Climate Action Plan goal of carbon neutrality on campus by 2050.